← James Nathan: Länder Toppen! 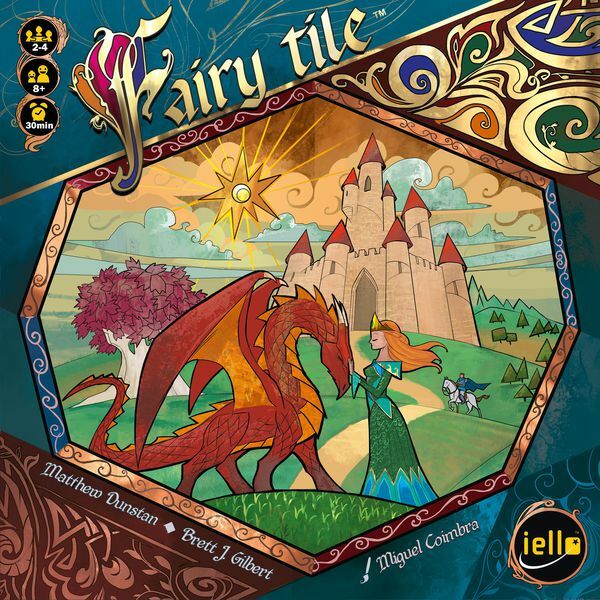 Fairy Tile is a new release from Gilbert and Dunstan (and trust me, I always want to say Gilbert and Sullivan)… In this storytelling game of sorts, each player is given an equal share of the 36 story cards to start the game. 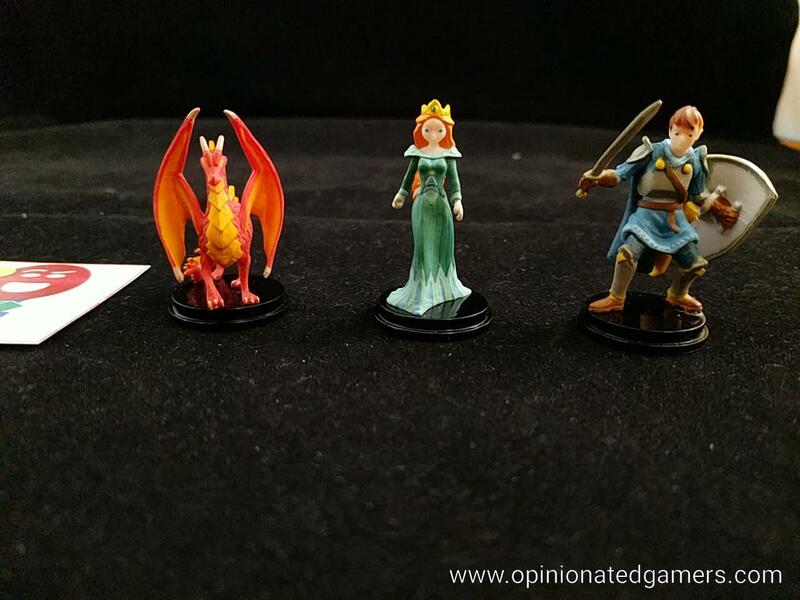 All of the stories revolve around the three protagonists (Dragon, Princess and Knight) and their adventures within the kingdom of magical land tiles. Each of the land tiles is a triangular shaped affair, made up of three different hexagons (can be plains, mountains, castles, forests – and sometimes there is a river running through those hexes). There are three tiles which always start the game and the Knight, Dragon and Princess all start on their designated starting icons. The remainder of the tiles should be shuffled, making sure to flip them over as they are double sided, to form a draw pile. There is a deck of 36 cards, each with a different part of the story, and they are dealt out evenly amongst the players in the game. Each player takes to top card from their individual deck and secretly looks at it. Each player is also given a wooden magic token – with the plain (non-activated) side showing. A start player is chosen, and turns are taken in order until one player manages to complete all of their cards – that player immediately wins. On a turn, the active player may either Develop the Story OR they can Turn a Page. 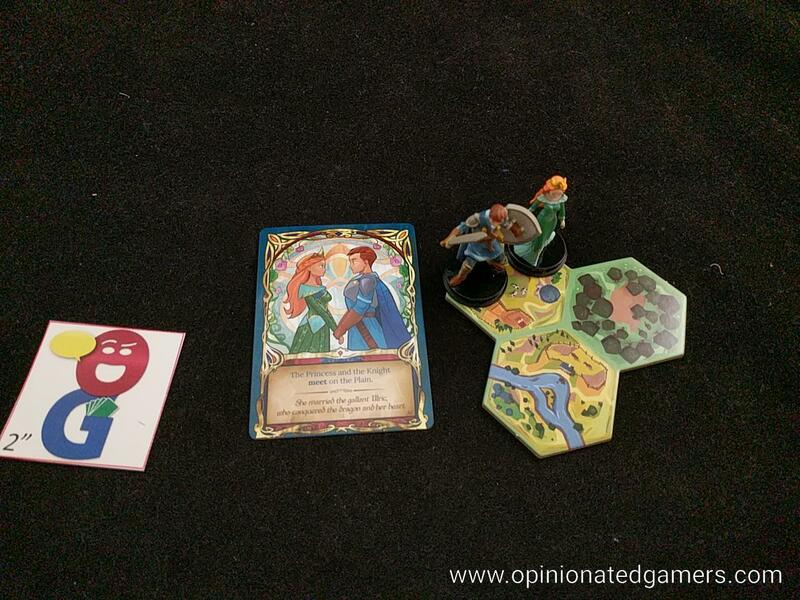 To Develop the Story, the player first goes on an Adventure by either moving one of the characters or adding a land tile to the Kingdom map on the board. If you choose to move a character, you choose one of the three characters and make a valid move. Each of the three characters moves in a different manner. The Princess moves exactly one space to an adjacent hex. She can also teleport from one castle to another at the start or end of her movement. The Knight always moves two spaces away from his starting space. He cannot make a two space move which places him directly adjacent to where he started nor can he go back and forth to end up in the same spot. The Dragon moves in a straight line as far as he can until he reaches the edge of the Kingdom. He only moves over land tiles – he cannot move over empty spaces – so a gap in the map will also stop him. If you choose to add a land tile, you take the top land tile from the draw stack and WITHOUT flipping it over, you place it on the map such that at least two edges of the new tile are contiguous to a previously played tile. If the new Land tile is adjacent to a River space, you must place the new tile so that it continues the river – if you cannot continue the river, you cannot place the tile there. Once you have either moved a character or placed a tile, then you see if you can Recount the Adventure. Each of the story cards has an objective on it. If the conditions are met, you read the card aloud, place it face up on the table in front of you and then draw the next card from your deck to start working on next turn. If this was the last card in your deck, you win! If you choose not to Develop the Story, you can Turn the Page. To do so, you discard the single card in your hand and place it on the bottom of your deck. You then draw the top card of the deck to replace it. You also flip your magic token over to the active side. On any later turn, you can use your magic token (i.e. flip it back over to the plain side) to take two actions while Developing the Story (two moves, two tiles OR one of each in any order). Again, the game is won by the first player to finish all of his objective cards. 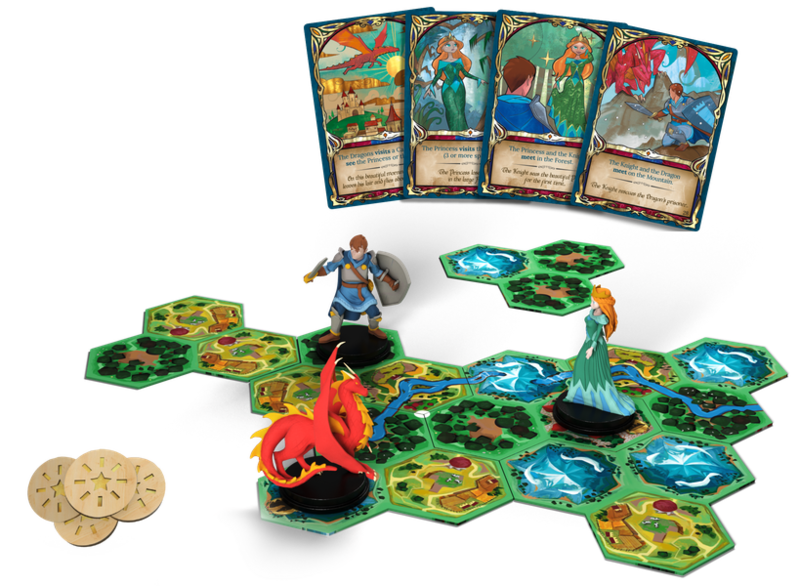 It should be noted that some of the cards may become impossible to complete – once all fifteen land tiles are played, the map can no longer be altered, and any cards which cannot be finished as they rely upon certain map features being present will be permanently impossible to complete at that point. If all players end up with cards that cannot be finished, then all players lose. Fairy Tile is a nice quick tactical game. At lower player counts, say 2P, you have more control over the game as there are fewer intervening actions between your own – and as such, you have a better chance of getting the board and characters in the places that you need to finish a card. In a 4P game, the game seems to come down more to luck – if the pieces happen to be in the right place when your turn comes up because any semblance of advance planning usually goes out the window in the three turns since you last did something. Individual turns are quick, oftentimes less than 30 seconds. As you can only do one thing each turn, and you only have one active objective at a time, your move is often obvious. If you can complete your objective, you simply do the thing which needs to be done. If you can’t score a card, you either trade in the card and get some magic – though it does take use a whole turn to exchange cards; having the ability to make two moves on your turn are often necessary to score some of the more complex cards – or you make a move that gets you closer to a scoring setup and then hope like heck that the pieces aren’t moved further away from the goal before your next turn. As you can’t see your opponent’s cards – there’s not a lot of defensive play in the game. I suppose if you played the game long enough, you could use the process of elimination to deduce what cards must be in the stacks of your opponents, but I don’t see this ever happening around here. This fact keeps the game moving right along because you generally can only consider your own goal card, and that limits (or really eliminates) any analysis paralysis. We have found, as we are all “mature” gamers, that it is mandatory to read the text of the card out loud – both the objective as well as the flavor text. We have then added our own house rule of requiring players to stick to a theme by adding in words or replacing words as necessary. 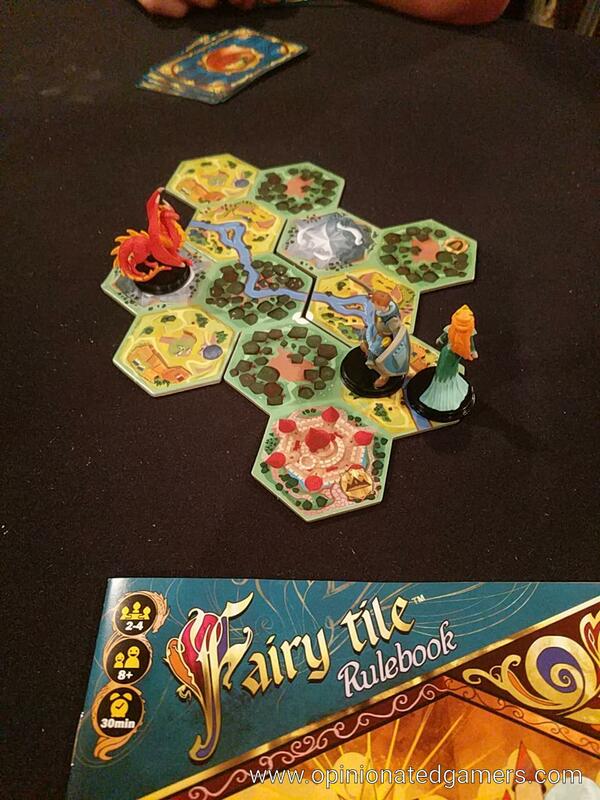 Thus far, our favorite variety has been Fifty Shades of Fairy Tile – again, because we’re so “mature”. So far, it seems like the best strategy in the game is to be exceedingly lucky with your card draws. Again, as you do not necessarily have a lot of control over the board, you’ll do a lot better if the board and characters happen to be in the right place when your turn comes up. The artwork on the tiles and cards is nice, though my aging eyes wish the flavor art on the card was just a smidge smaller and the text a smidge bigger! The three miniatures are nice and eye-catching. Everything fits neatly into the vac tray. I have read some reports online about the vac trays not fitting the components, but everything fits perfectly in mine! Fairy Tile is nice whimsical game. Again, with the lack of significant planning/strategy, there isn’t much to do. As some in my group have said (when we played Russian Fairy Tile) – In Russia, you do not play Fairy Tile… Fairy Tile plays you! But, for 15 minutes, it’s a nice filler, starter, or closer –and it will certainly play that role in our game group this summer. Steph Hodge: Beautiful game, but left me less than excited. Would play again, but wouldn’t request it. Dan Blum (1 play): The idea is good, the tactical puzzles can be interesting, and the art is nice. However, even with three players the lack of control was a serious problem – for much of the game it was impossible to accomplish anything unless you deliberately buried a card to get the ability to make two moves in a row, and even that is chancy since you don’t know what new card you will have to work on. The only exception to this was when a player accidentally set up the next player, which is also not great from a gameplay standpoint. Now, this is a light game so I don’t want to take it too seriously, but this lack of control doesn’t just make the game lighter – it makes it take longer. It went on some time after we had used up the fun. I can’t imagine playing it with four players. However, I can imagine that it’s decent with two players; with only one other player to mess up your plans it should be possible to make progress a lot faster.